I never thought I would be a wedding photographer, at least until the time came for me to make money. Naturally, this meant I would end up being assigned to cover weddings for two days at the institute. I was working alongside an institute reporter, Sade Strehlke, to photograph brides who had traveled to New Orleans to get married. Usually in celebration they hire a second line band to march down the street when the ceremony is over. This shouldn’t have been a surprise to me as New Orleans is known for its parties, but it was an interesting event for me to witness. To be frank, I have never attended a wedding as a guest. It was a new experience for me to witness the culture of events that occur in a more traditional wedding. And so frame by frame with my camera, I began to understand more the process of the ceremony for the bride and realized that, even at the most seemingly formal events, there is always room for the unexpected and unfamiliar. 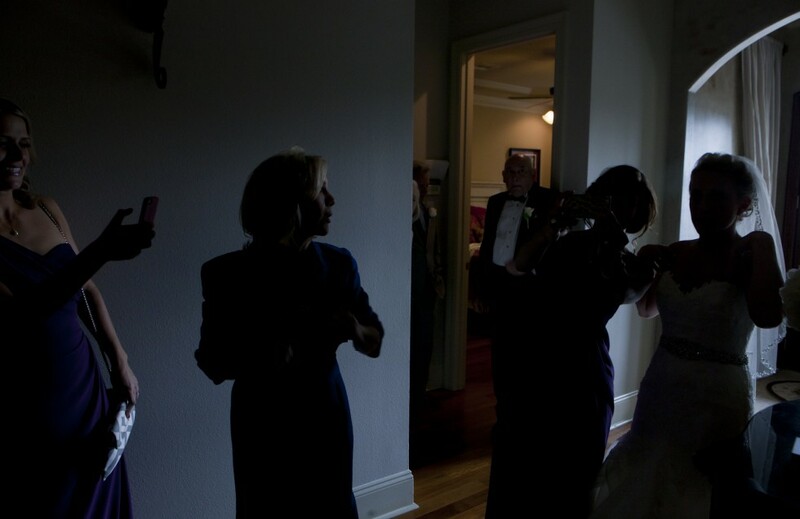 A press photographer coming to cover a wedding is not something a bride usually expects, and the photographer who was covering it was just as unsure of what to expect.